How much freezer space will I need for my meat? A good rule of thumb is to allow 1 CF of freezer space for every 25 to 30 lbs of packaged meat. For example, the delivered weight of a 1/4 Share of beef is approximately 100 lb. so you would need roughly 3.5-4 CF of freezer space. Note that a typical home freezer ranges from 6 to 10 CF including any ice maker but it’s best to check your model specifications. Most cuts delivered frozen in consumer-size, vacuum sealed packages. For example, steaks and chops have one or two steaks per pack, roasts are typically 3-5 lbs, and sausages and bacon are in 1 lb packs. Bulk sausages and ground meat are usually in 1 lb chub bags, not vacuum sealed. Labeling on each pack will include cut of meat, weight, and either a USDA or NCDA&CS inspection stamp. What if there is a power outage and the meat thaws? According the USDA, food can be refrozen if it has been maintained under 40 degrees F. For meat, refreezing may degrade the quality since water is pushed out of the meat each time it goes through a thaw cycle. It will still be safe to eat, but the quality may suffer, especially with quick cooking cuts like steaks or chops. Find USDA’s information on safe meat thawing here. What breed of pigs do you raise? 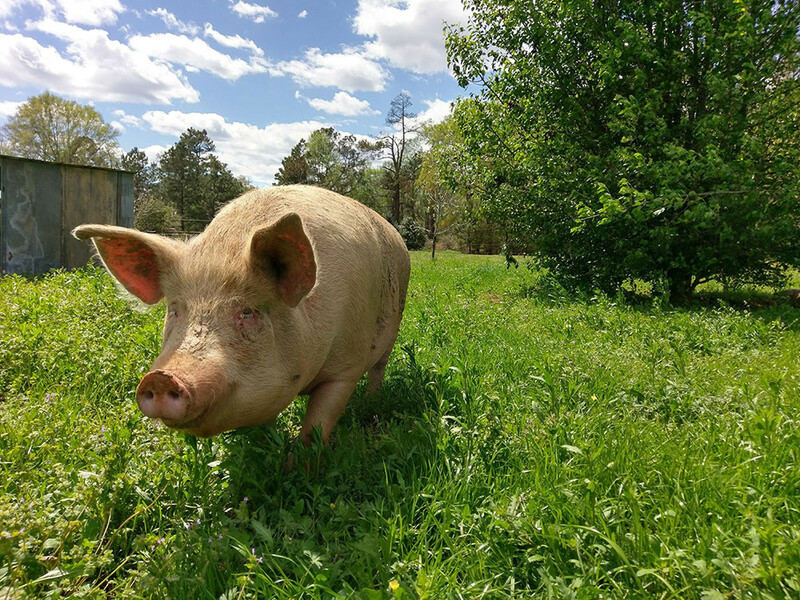 Our pigs are a “farmers mix” of heritage breeds that perform well outdoors on pasture or in the woods. Our current breeding stock is predominantly Hereford, Berkshire, and Yorkshire with a little bit of Duroc and Tamworth. Mixed breeds tend to be hardier and offer a balance of the good traits found in each breed. Does pasture-raised pork taste different? Yes, better! A diet strictly of grass and greens contributes to a beneficial fat profile rich in Omega-3 Fatty Acids, which, in turn, lends to a richer, fuller pork flavor experience. Where are your cattle sourced? 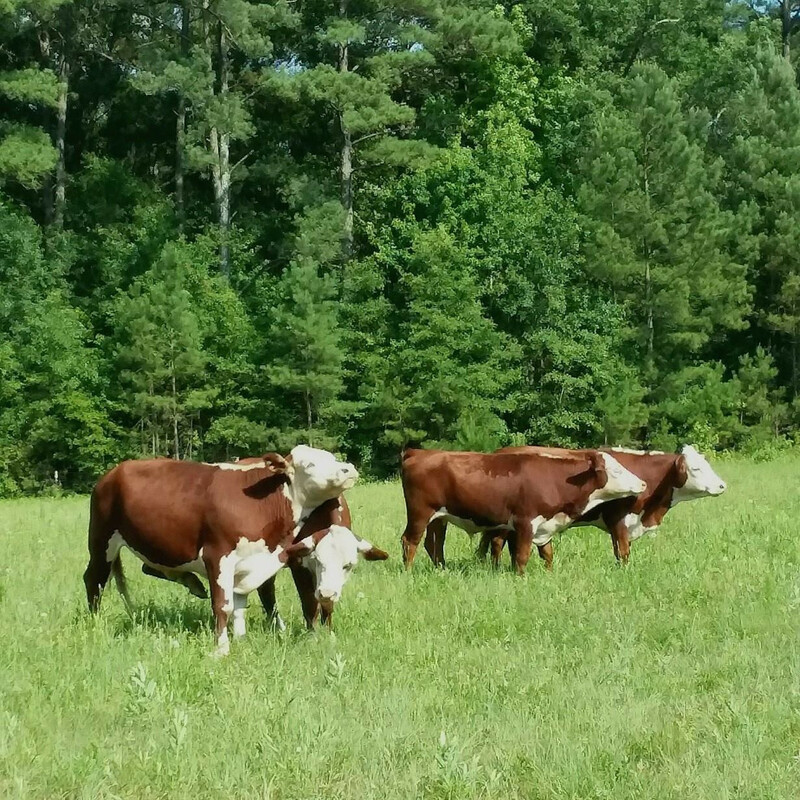 All calves are sourced locally in central NC direct from the farms where they were born, not at auction. Our small scale allows us to know where our animals come from, learn about their breeding and how they have been cared for. We have several local sources for feeder calves that have the breeding to do well in a grass-only scenario. Yes, our cattle are managed to meet or exceed American Grassfed Association standards. Growing calves only get mama’s milk and then pasture or hay consisting of grasses, clover, and all manner of leafy greens. They are never given hormone growth promoters or low dose antibiotics. Grass-fed cattle grow at a natural rate and, therefore, take longer to raise. Does grass fed beef taste different? Yes, better! A diet strictly of grass and greens contributes to a beneficial fat profile rich in Omega-3 Fatty Acids, which, in turn, lends to a richer, fuller beef flavor experience.